There are limited options available if you plan to stay in BoyzTown during your trip to Pattaya. BoyzTown is actually located in a small street knows as Pattayaland 1 Alley. I recently spent a night in all 3 hotels here to find which was the best and why. I did this at the start of Thailands high season, November 2017. It goes without saying this is based on my personal opinion and experiences, which may differ from others experiences. I will, however, try to be as objective as possible about these reviews. There are 3 BoyzTown hotels to choose from, The Ambiance Hotel, Copa Hotel and New Café Royal. It’s worth keeping in mind these 3 hotels have very similar nightly rates as they seem to compete for customers. Keep in mind these are largely gay establishments and although there is always a couple of heterosexual guests, you won’t feel out of place here as a gay visitor. I am starting with the Ambiance Hotel because I personally believe it to be the best of the 3 BoyzTown hotels. Although it is slightly dated, the rooms are cleaned to a good standard and the beds are comfortable. It’s the larger of the BoyzTown hotels and the corridors can be a bit of a maze. Some might think of this as a fire risk. The staff here are always friendly, with the reception offering free beach towels and light refreshments on check-in. Don’t expect anything modern in the rooms. The TVs are 20-year-old CRTs. The Wi-Fi is reliable though. The Ambiance Hotel allows guests to join you in your room with no extra charge. There is a restaurant and terrace on the ground floor which offers a great spot for watching the BoyzTown madness in the evenings. There is also a roof terrace on the 5th floor if you would rather have some privacy. It’s worth noting this is a non- smoking hotel. If you want to smoke you have to go out the front onto the restaurant terrace, or up to the 5th-floor terrace. The Ambiance does not offer free breakfast. The restaurant is over-priced and the food mediocre however this shouldn’t be a problem for most people as there is a vast number of food options in the surrounding area. I am ranking the Copa Hotel as the second best option for BoyzTown Hotels. The hotel has a very small entrance but modern. The hotel itself doesn’t have a restaurant or terrace and does offer smoking rooms to guests who want to smoke. The rooms are of a similar standard to the Ambiance, however, call it bad luck, I had a very old and uncomfortable lumpy mattress. I did not get a good night’s sleep here. There are no modern things here, with old CRT televisions. The cleaning is of an acceptable standard, so no complaints there. The reception staff who work here are exceptionally friendly which is always nice when checking in or asking questions. The Wi-Fi was reliable but slow. The real let down here is the lack of terrace or restaurant at the front of the hotel. Having stayed in many hotels in Thailand and Pattaya, this would be one of the worst I have experienced. The check-in process was messy and took over 20 minutes. The staff didn’t have a clue what was going on. Also, the bar and restaurant downstairs is closed and just a storage room. The room itself was very small and not clean. There was clearly lubricant spread all over one of the bedside tables and hotel room phone. The sheets were dirty and the bathroom was not clean with the toilet having been used and not flushed or cleaned after. The room smelled old and dirty. It was very small and dark with little natural night. There was a small LCD TV on the wall but this hardly made up for the rest of the problems. New Café Royal does offer a free breakfast and this was of reasonable standard, with American & British cooked options with Bacon, Eggs, and Sausages. You also get 2 rounds of toast and free tea, coffee, and orange juice. This is served on the small terrace outside the closed inside bar. To round this up, the Ambiance Hotel is in our opinion the best BoyzTown Hotel, however is likely to have the highest room rates. The Copa Hotel is a good mid-range option. 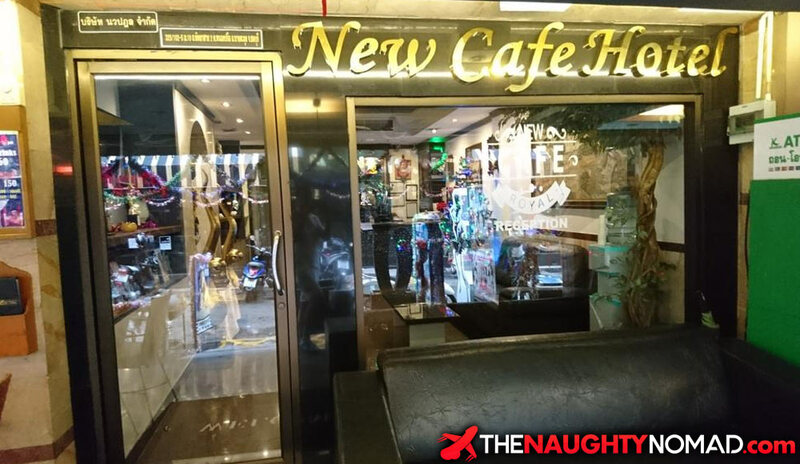 If you are really penny-pinching, which is never easy in Pattaya, New Cafe Royal will offer you the cheaper rates, but as the old saying goes, you get what you pay for. When checking multiple booking sites online, the best rates were always on Agoda. Let us know in the comments about your experience with BoyzTown hotels. Did we get anything wrong?